. But first things first. Now let’s check her characteristics! Carnival Paradise has a tonnage of 70,367 gross tons and a capacity of 2124 passengers and 920 crew members. Carnival Paradise rooms’ types include Interior, Ocean View, Balcony staterooms, and Suites. By the way, the liner got 38 new cabins, including two Grand Vista Suites and 22 Junior Suites during her recent drydock. Currently, the ship is homeported in Tampa, Florida. She takes her guests on 4 and 5 Night Western Caribbean sailings. Besides, she is scheduled to operate several sailings to Cuba. Well, it’s time to check the most romantic things to do on Carnival Paradise! Pleasant water, amazing illumination, starry sky above your head – what can be more romantic? Swimming in the pool in the evening will help you wipe out tiredness and get all the energy you need for the next day. And it’s going to be really eventful! Pictures help us to re-live exciting moments and refresh our memories. Just imagine long winter evenings and you two sitting by a fireplace and remembering your adventures. It could be very heartwarming. Do you have a favorite song? Even if you don’t, you can sing any song you wish together, and it will become the melody of you love. And you should definitely dance this night away! By the way, your age doesn’t matter. Love knows no age. This game requires incredible concentration, patience, perseverance, and support of your loved one. The stunning views around will make your little competition even more exciting. Show at the theater has always been a great choice for a date: to relax, enjoy a brilliant performance, receive positive emotions, etc. Besides, it’s an excellent reason to put on your elegant attire and visit the onboard Beauty Salon. You both deserve to look like a Queen and a King of this ship! We know, that sounds cliché. However, you can make this dinner very special. Carnival Paradise has a whole lot of dining venues for every taste. Choose your best one and enjoy delicious meals, fantastic atmosphere, nice chats, beautiful views, and yourselves. We believe it may be very exciting and inspiring. Of course, a win is not the main thing in these competitions. The main thing is that it’s an excellent way to get close to each other and maybe even bring some nice souvenirs home. Yes, we know that you’re already the grown-ups. However, we highly recommend that you get absolutely wet and happy together. 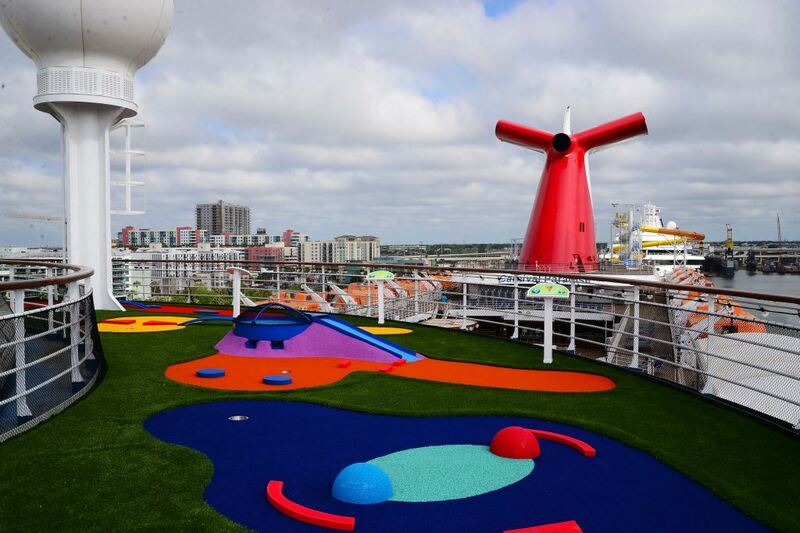 The Carnival’s WaterWorks Water Park is the ship’s latest addition, and it’s a perfect way to feel like a child. It does not matter what you’re going to offer your loved one: to walk around the ship at night, take another cruise, buy a dog or get married. The most important thing is that you’re both enjoying unforgettable moments of your cruise right now. Of course, you can turn any activity on Carnival Paradise into unforgettable romantic adventure, whether it's a day spent at the spa, Green Eggs and Ham Breakfast, evening at a casino or just spending time in silence watching the boundless ocean at sunset.